The Mooer Ensemble King Chorus pedal. As you can see it is very small and compact and needs an external power supply. The case feels solid as do the knobs and controls which are easy to read and use and the LED lights up when the footswitch is pressed. It delivers a pure analog chorus sound which has three adjustments – level, depth and rate. Overall this is a great little pedal that belies its size! The Mooer Ensemble King offers up some fabulous warm and lush chorus sounds from shimmering and subtle at the lower speeds through to outright bizarre and experimental at quicker speeds. There’s also a depth control to keep things in check at any speed setting. We have tried this with both an electro-acoustic and electric (semi and solid body) through a VOX AGA acoustic amp and an Egnater Rebel 30 valve combo and the Vox MV50 clean amp and it produces a lovely warm tone that adds subtlety and depth to your sound. 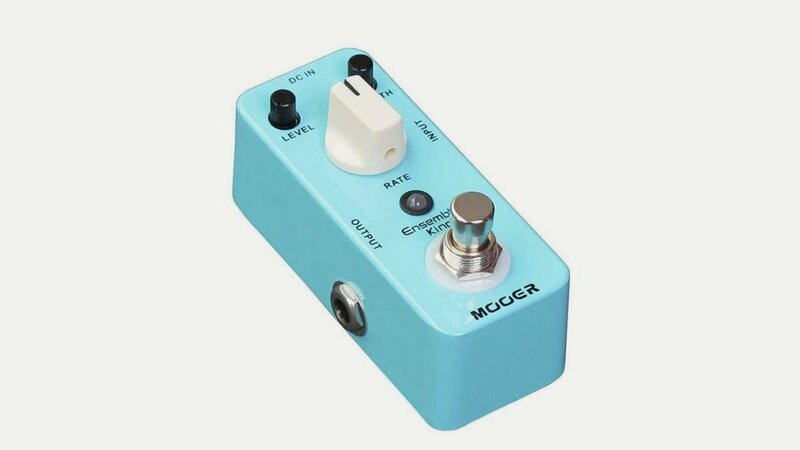 Mooer are now a well established pedal maker, based out of China. Their comprehensive micro pedal range has something for everyone with around seventy in the range. These include overdrive, fuzz and distortion pedals; wah, delay, octave, flanger and phaser; chorus, reverb and tremolo; boost, pitch and compression. Some are cheekily in the colours of the ‘go-to’ pedal in that category so that you are in no doubt which pedal it is copying! Prices are around £40-75 and they all have a full metal shell, true bypass and feel sturdy and well made. These pedals are tiny though – there is no room for a battery so you need to plug it into a mains adaptor. If you have five or more of them you can buy a little case from Mooer that connects them together and uses one power supply. The weight of this chorus pedal is 160g – about 5.5 ounces. Because it’s so small you need to be careful you don’t lose it! For bass players they have the Ensemble Queen!